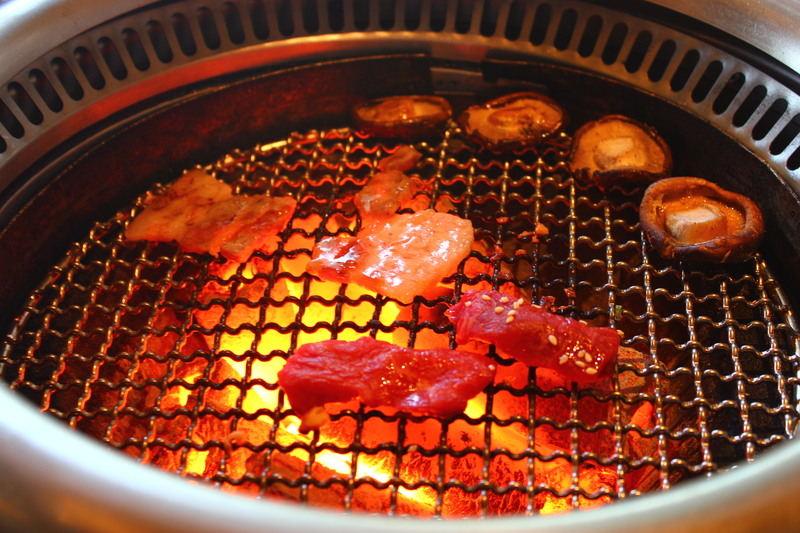 The Place Managed by Creative Eateries, Tajimaya is a casual Yakiniku style Japanese restaurant which specialises in its charcoal grill meat. The space at Vivocity is quite spacious and faces the waterfront if you manage to get a table towards the back of the restaurant. I came specially for the lunch buffet, which has two seatings for 120 minutes: 1130am and 2pm. tRP finds the lunch buffet relatively value for money, as it includes a range of meat and sashimi, starting from $44.90++. The Food tRP went for the $44.90 buffet which includes Salmon and Tuna Sashimi, a range of meat from US Black Angus Beef (Sirloin, Short Rib) to Pork Collar/Loin, seafood such as Grill Prawns and Salmon fish, Grill Vegetable as well as soft drinks. If you are a Wagyu Beef fanatic and feeling a little rich, there is the more pricey ($89.90++) buffet option. It is always appetising to kick off the buffet with Salmon Sashimi. The quality is passable, not the best quality of salmon used but we can’t complain much since it is a buffet. In case you are wondering, there is no salmon belly available. From the Grill Vegetable selection, we tried the Shitake Mushrooms, which is quite nice. The only Grill Seafood we tried was the Salmon Fish, as we love salmon. The salmon is fresh and does not take very long to grill over the charcoal. For the beef selection, we tried all the different types of beef: Beef Loin, Beef Sirloin and Beef Short Rib. I can spot some marbling in the beef, which is a good thing. As for the quality of the beef, tRP concludes that it is not the most premium in town, but good enough to feel that it is worth the price of the buffet. The beef is not very succulent, and we thought that the seasoning could be better. As for the Pork, we tried all of the variety as well: Kurobuta Pork Belly, Pork Loin and Pork Collar. On the contrary, the quality of the pork seems to be an edge above the beef. The pork meat is tasty, especially the fats (excuse the calories and sins) after it is charcoal grilled. The Garlic Fried Rice is a good staple option but we would advise you to share a bowl first to avoid calories overload. It is however nothing to shout about. Be warn that the temperature of the charcoal is soaring, in fact a little too hot at the beginning that it was not very comfortable to grill it. If the heat subsides after a while, just request for the staff to add more charcoal. Rants Quality of the buffet is only a little above average, which fussy eaters like tRP noted easily. The service was totally slipshod at some points, when the service staff change our grills and replenish the charcoal. For example, our halfway done half raw meat was removed by them onto our plates, which is not very hygienic. The general attitude of service staff gives us the impression that they do not have a heart to serve at all. Will I return again? It is tough for us to be back again, given that there are better Yakiniku options available even though it may not be buffet style.